Sediment and mussels are the two international ‘gold standards’ of marine pollution monitoring. During Phase 1 of PollutionTracker, we collected sediment and mussels from 55 sites along the B.C. coast. Samples were sent to specialized laboratories for analysis of over 400 individual contaminants. Sediment is used around the world to evaluate pollutant inputs to aquatic environments, as it can be both a contaminant ‘sink’ as well as a ‘source’ for adjacent food webs. Nearshore sediment samples were collected from targeted depths of 10 to 20 m using a Petite Ponar grab aboard a small boat. 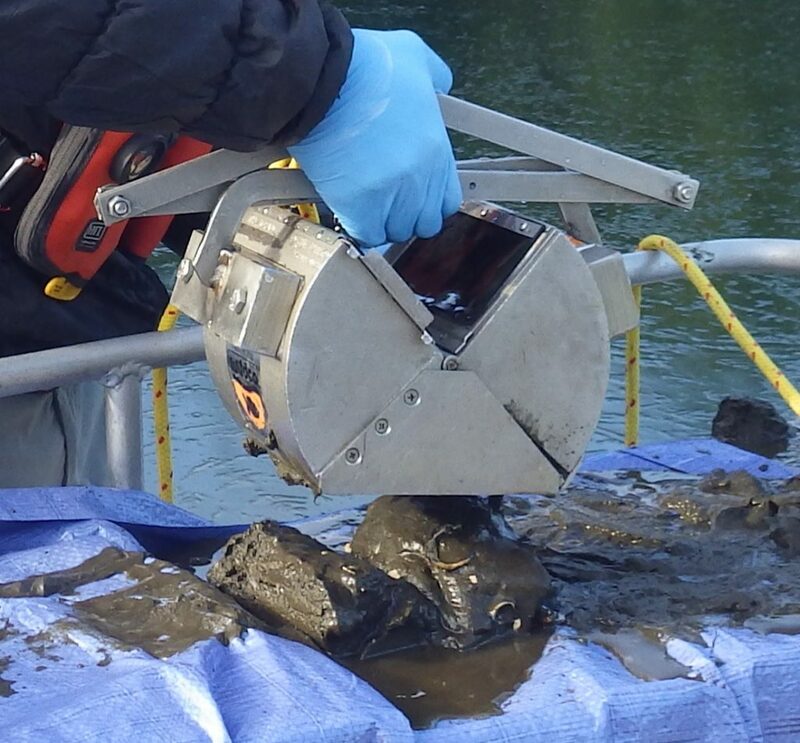 Depositional areas with fine-grained sediment were targeted for sampling. The top 2-5 cm of sediment was taken from three to five grabs at each site, mixed together, and submitted for laboratory analysis. Sediment was collected from 51 of the 55 sites coast-wide. Mussel samples were collected from shore within 2 km of the sediment collection locations, where possible. 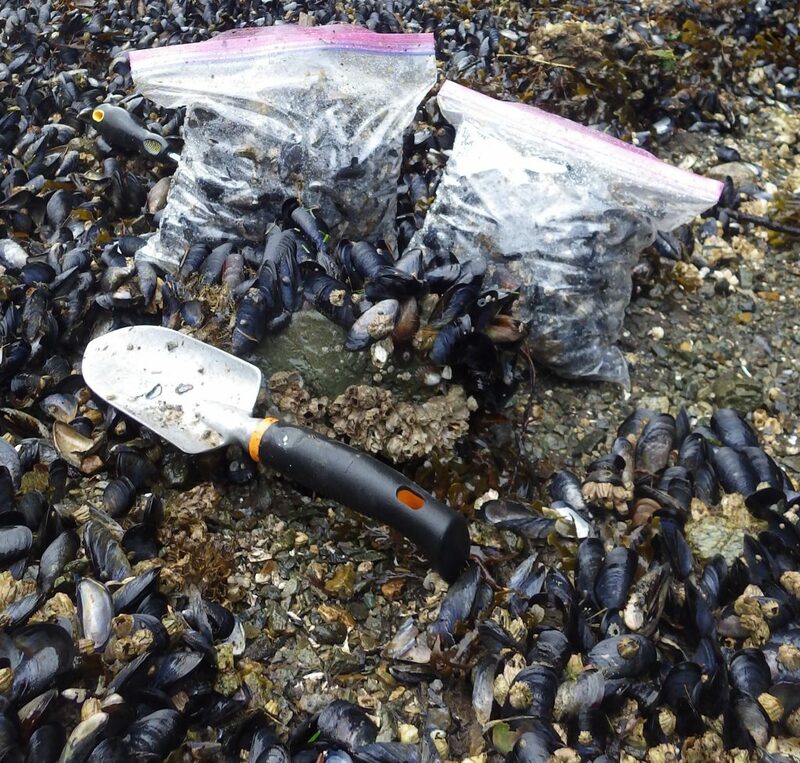 Mussels were collected from 33 of the 55 sites coast-wide. Mussels were not present at all of the locations where sediment was sampled. Three ‘Tiers’ of analysis were used for sediment and mussel samples, with Tier 3 being the most comprehensive. Tier 3 analysis includes over 400 individual chemicals. The choice of analysis level was contingent on the availability of funding, the interests of partners, and the sampling intensity within a given region. Within all major contaminant classes (e.g., PCBs, PAHs, PBDEs, metals, pesticides), multiple individual contaminants were analyzed by the laboratories. For example, 209 PCBs were analyzed, and many were detected in samples. For ease of presentation, we provide contaminant totals where possible (e.g., total PCBs is the sum of all individual PCBs measured). This approach is used for groups of contaminants that are structurally similar and is not typically used for metals, pharmaceuticals, or different pesticides. We selected for presentation three metals of particular concern in the marine environment (cadmium, lead, and mercury), although other metals were also analyzed. Legacy pesticides and current use pesticides are presented as totals in the bar graphs to provide an indication of overall levels. A further breakdown of individual pesticide levels is provided for each bar (hover or click on each bar). Available Canadian Council of Ministers of the Environment (CCME) sediment quality guidelines protective of marine aquatic life are shown on the bar graphs. The lower ‘Sediment Quality Guideline’ is the concentration below which adverse biological effects are expected to occur rarely. The higher ‘Probable Effects Level’ is the concentration above which adverse biological effects are expected to occur frequently. British Columbia Working Sediment Quality Guideline levels are equivalent to CCME guidelines for the contaminants shown. It is important to note that sediment quality guidelines are meant to be protective of the marine system as a whole, but are largely based on toxicity endpoints for invertebrates, and are not necessarily relevant to higher trophic level organisms (e.g., marine mammals). More detailed data analyses will be conducted in the months to come, and results will be presented in scientific publications. Data are blank-corrected, meaning that any individual contaminant levels measured in the laboratory ‘blank’ sample (which theoretically should not contain contaminants) have been subtracted from the concentration measured in each sample. When the concentration measured in the blank is equal to or greater than the sample concentration, the sample concentration is reported as ‘0’. Sites were ranked relative to each other for each group of contaminants presented, where a rank of 1 indicates the site had the highest measured concentration of a contaminant among all sites coast-wide. This ranking does not provide an indication of the potential for adverse effects, but rather a relative indication of contamination along the coast. For example, a site may be ranked 1 for contaminant X, but this contaminant level may be well below a relevant regulatory guideline level. In addition, contaminant X may not have been detected at any other sites, giving site X a default ranking of 1. Not all samples were analyzed for all chemical classes. While the overall ranking for a site is based on 51 sites for sediment and 33 sites for mussels, the total number of sites for each contaminant class reflects the level of analysis selected at that site (e.g., Tier 1, 2 or 3). 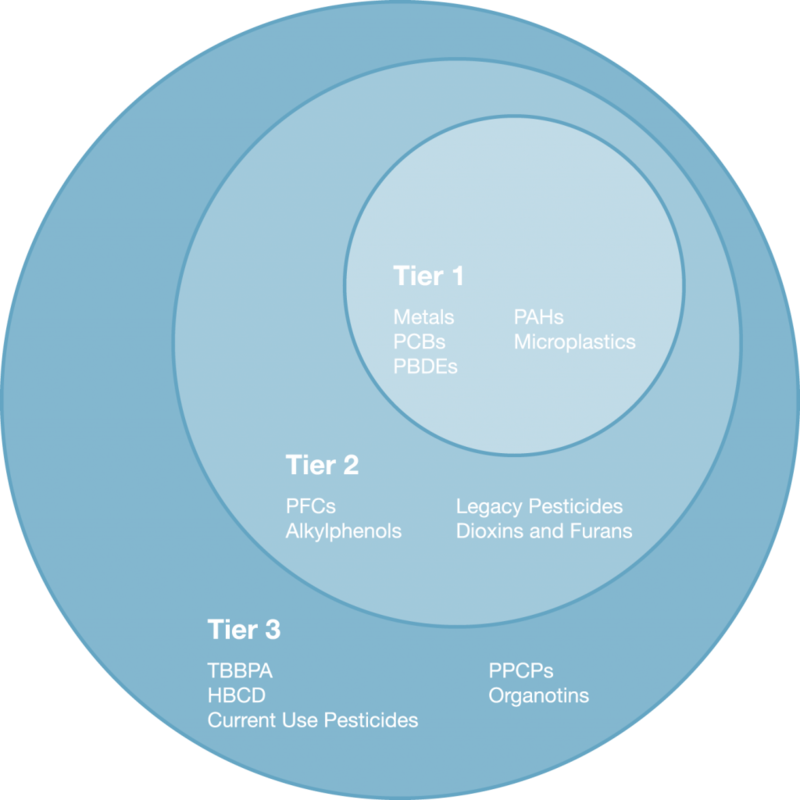 For example, as a Tier 1 contaminant, PAHs were analyzed at all 51 sediment locations, while the Tier 3 contaminant TBBPA was only analyzed at 37 sediment sites.